Almond Joy Cocktail – an easy cocktail recipe that tastes like an Almond Joy Candy Bar! Vodka, amaretto, creme de cocoa, and Almond Joy Coffee Creamer make one tasty drink! I’ll never forget the day I had an Almond Joy as an adult. As a kid I said “I hate coconut” without ever really even trying coconut and one Halloween as we were following our children around, a friend handed me a mini Almond Joy and I was immediately smitten. I went on to eat bags and bags of them and make every sort of Almond Joy treat you can imagine, like brownies and cookies and pies, oh my! I still can’t even buy a bag of mini Almond Joys to bake with unless I bake with it THAT DAY. Otherwise I’ll go to grab it for the recipe and all I’ll find are empty wrappers hidden underneath, like I’m hiding the evidence from myself. Of course, I love using coffee creamer in coffee (I look forward to that teaspoonful every. single. day) but I also love using coffee creamer IN recipes. I’ve put it in traditional things, like dip and chocolate sauce, monkey bread and french toast, but I also love it in COCKTAILS! 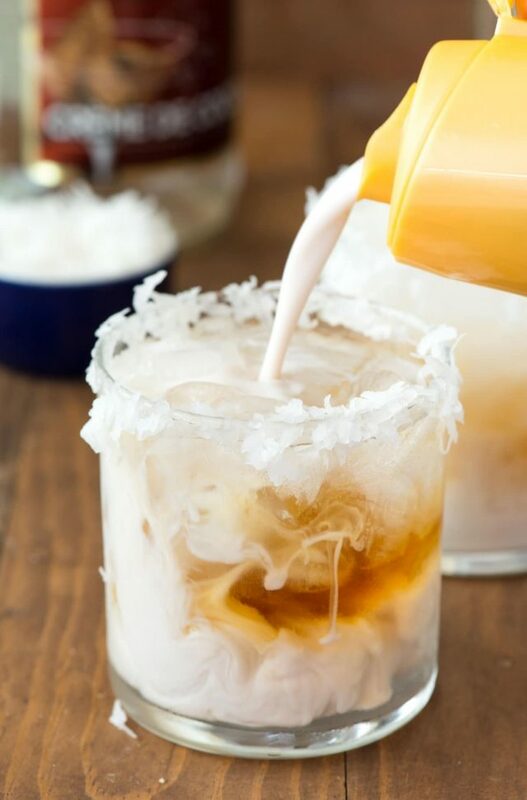 Adding a bit of your favorite flavor coffee creamer in place of cream in a drink adds a new dimension to any cocktail or cocktail alike. Hot chocolate becomes PEPPERMINT or a martini becomes a sugar cookie. Or…a cocktail becomes an ALMOND JOY CANDY BAR. 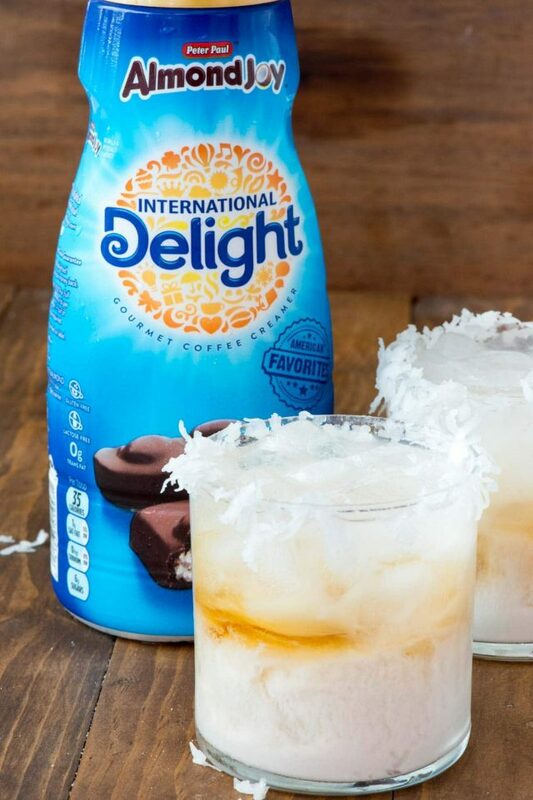 I used my favorite International Delight creamer, the Almond Joy flavor, to create this Almond Joy Cocktail recipe. It has just 4 easy ingredients and whips up fast. It’s the perfect dessert or after-dinner drink, or a nice cocktail for you sweet and creamy drink lovers out there. So what makes an Almond Joy Cocktail taste like an Almond Joy candy bar? 4 things: Vanilla (or whipped or plain) Vodka, Creme de Cocoa (the clear one), Amaretto (a nice dash of almond) and Almond Joy coffee creamer. Pour them all over ice and you have the makings of the perfect cocktail recipe. 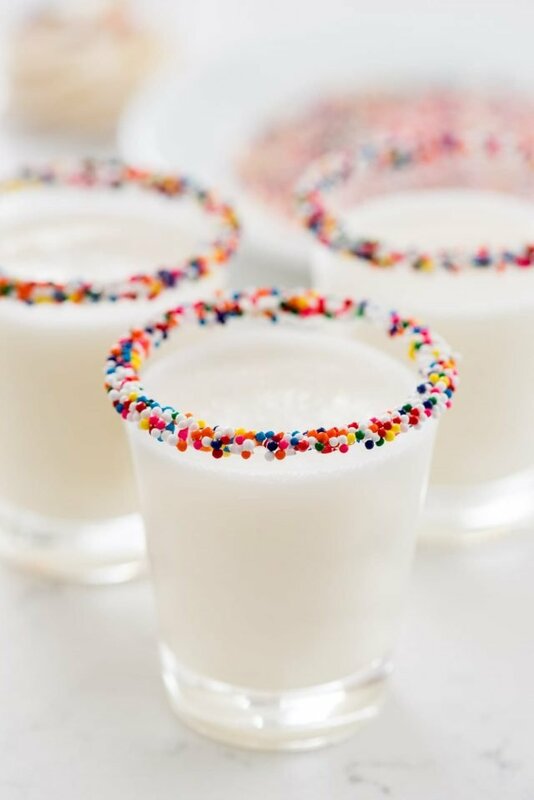 These Almond Joy Cocktails are also super pretty to watch come together in the glass. The swirl of amaretto and creamer look gorgeous together! 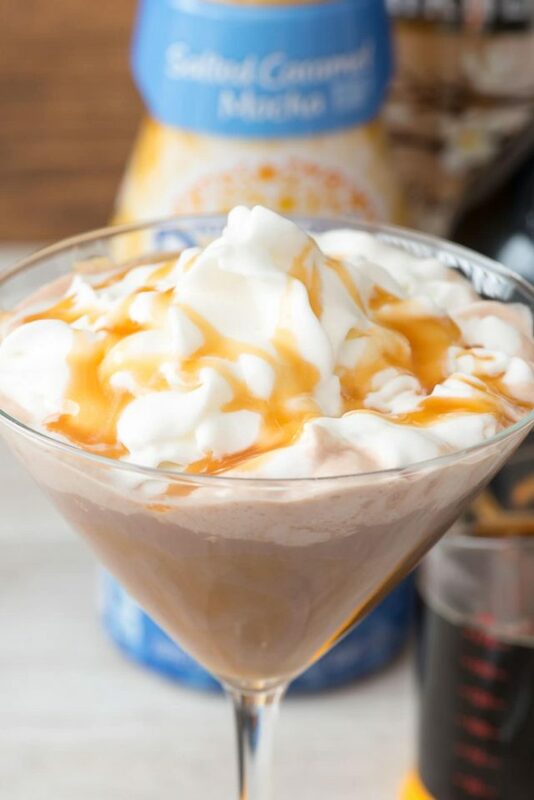 If you love Almond Joy candy bars you’re going to LOVE this Almond Joy Cocktail recipe. Almond Joy Cocktail - an easy cocktail recipe that tastes like an Almond Joy Candy Bar! Vodka, amaretto, creme de cocoa, and Almond Joy Coffee Creamer make one tasty drink! 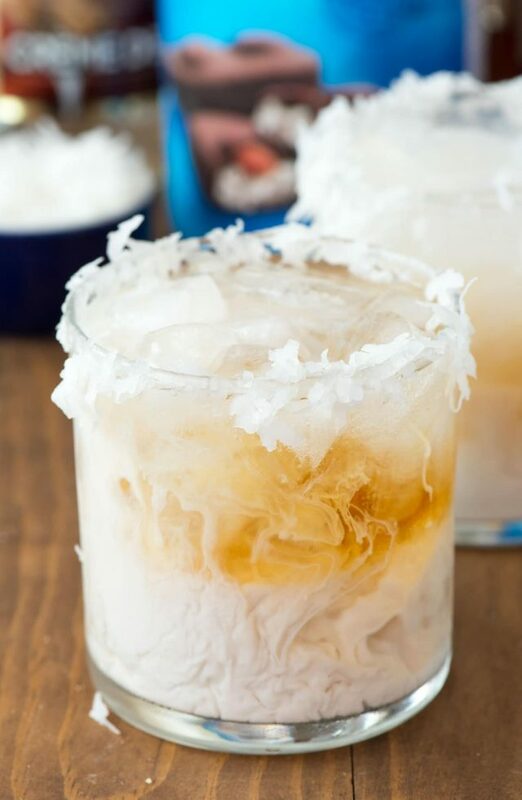 To rim the glass: place some corn syrup on a plate and shredded coconut on another plate. Dip the rim of each glass in the sticky corn syrup, then in the coconut to coat. Fill glass with ice. Pour in vodka, then creme de cocoa, the amaretto. Top off with coffee creamer to taste. 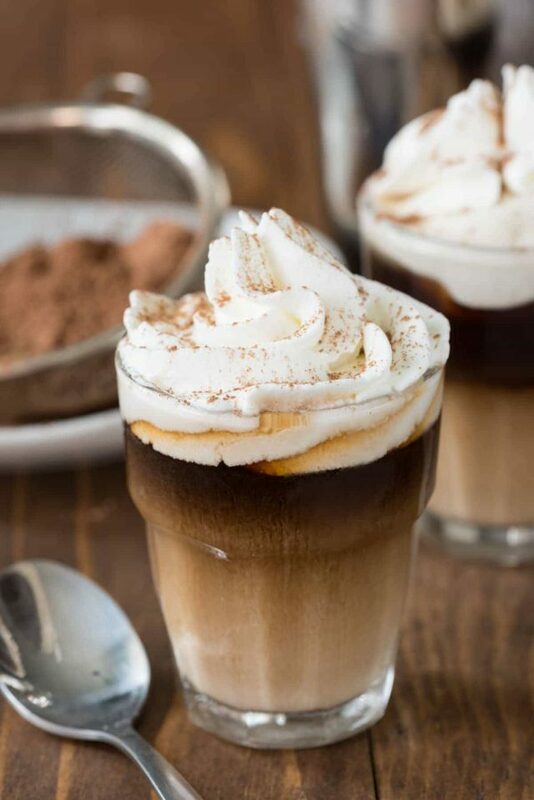 See all my coffee creamer recipes here! JOOOOOOYYYYYYYYY TO THE WORLD, all the five o’clocks now, joy to the fishes in the deep blue sea, joy to you and meeee (drinking this cocktail)! Being that I like a little coffee with my creamer, this would be perfect for me! I had the Almond Joy years ago loved it in coffee. Now I need to make this with it!